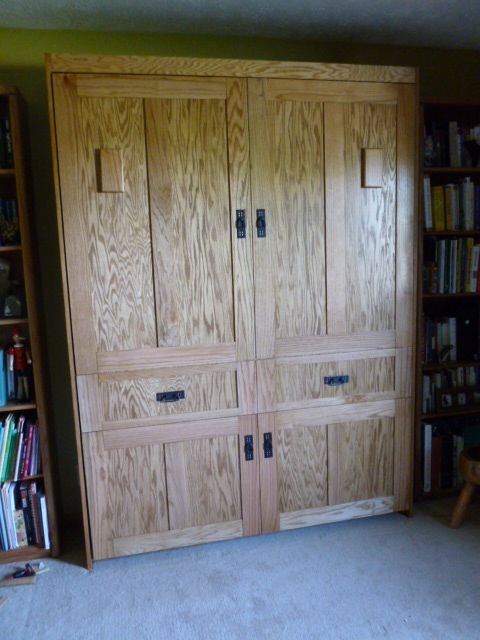 While posting about building a murphy bed, I’ve had the pleasure of having Joyce stumble upon my website. Seeing that even someone like me could do it, she decided to build a bed herself. She has finished her project, and she sent me pictures. It looks great! It has really nice trimwork that finishes it off beautifully! Hi Brad, Thanks for writing back. I feel the same way about building the bed. I had to do it because I couldn’t afford to buy one, but now that it’s done, I am so proud of myself for doing it! I have wanted to do it for a couple of years but was really afraid to tackle a project so large. My husband didn’t help, said it would look terrible. That made me all the more determined. I was going to make him eat his words! Oh, my goodness – it’s gorgeous! The trimwork on the front is just perfect. I have to ask Joyce, is that your own design? It looks so good with the cabinet pulls. Does your husband like his words plain or with ketchup? Thanks so much for all your comments! 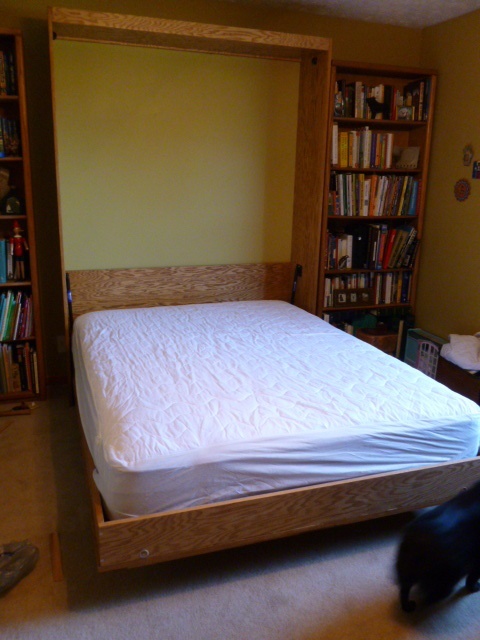 I looked at all the beds online and took ideas from a couple of them. The directions were quite clear and Brad’s blog gave me the confidence to start. Had so much fun doing it and the husband is very proud of me. The grandkids love it! How gorgeous Joyce!!! Excellent!! Were you already good with tools? I mean is this the 1st time you ever tackled such a project? I have to admit, I’m afraid of saws. I’ve never used one. You should be very proud of your work! And here’s to the lucky people that get to sleep in that bed! It was my first woodworking project and I have never used power tools before. I did have my big pieces cut at Lowes, I just took the cut list with me, so that really helped. The saw was a little intimidating but you get used to it pretty fast. Go for it!